In the name of full disclosure I thought I might share this. I work in a room meant for 4 people, alone. My job requires I stay at my desk near the servers most of the time. Which means I get very little social interaction with people all day long. Which means I correspond mostly with people via email. I've been doing this since July of last year. By myself, corresponding via online means. It loses the personal touch, and as a result I find myself psychologically ready for furlough, to be among family and friends and re-establish face to face communication. This week has been an interesting struggle for me in my faith. Each day this week has brought with it some new financial information. Monday - we found we need a 30% increase in support in order to return from our furlough. was someone out there praying for us? Calmed because God has always proven faithful financially. He will provide. And we're so thankful for how you all have been used by Him. It seems that for 3 years I've been able to not worry about our source of finances, while being the best steward I can be. And then today with all these procedural changes I found myself upset. God I can't control what this world throws at me. But I can control my attitude. Thank you for where we are and what we're doing. Here's a little story about the craziness that follows one simple 'YES'. A few years ago I changed my outlook on life and started saying 'YES' to many of the odd requests that came my way, instead of saying 'no'. As a direct result of this I went on a short term mission trip, became a Director of Awana Sparks, became a full time missionary, earned a trip to Hawaii, and now... have become an internationally sought after writer. A few months ago I had the rare opportunity to go to a remote pacific island and attend a ceremony dedicating a New Testament in the heart language of a large people group located in the Menapi area of Papua New Guinea. The language group was called the Gapapaiwa. You may have even seen a video I did on the event. When I returned our director of publication said 'Chad I need a few quick words on the event, can you write a story with a very short deadline?' I replied, "YES". I wrote the story, and in my opinion it was rather dry and not my best work. BUT I wrote it quickly and was able to get it to her in under 30 minutes. I suppose professional newspaper writers would consider the actual writing portion of a story the last and shortest step. But for me 30 minutes was fast. Since then, apparently my name has been floating around and I recently was asked to attend a series of 'nice to meet you' meetings where I was then asked to write for a new project meant to help the world become informed about the affect that Bible Translation has on people's lives. The main idea - The Bible changes lives... let's tell people how! Well, I agreed again to help in my spare time, write a story. So I was given an assignment. It turns out the first assignment I was given, was to write a story based on an interview from a man I met a few weeks ago. I helped him set up his village email system and while we waited for software to load, I asked him about his story. I will begin writing the story as soon as the interview is complete. I'll keep you updated. TODAY, I got an email from someone in China who read my story online and contacted me asking permissions to translate the story into Chinese so they could post it on their website. I of course had to refer them to our communication director. So, saying yes the 1 time, has turned into this situation where suddenly I find myself 'hyped'. I do not consider myself a writer. I don't know why I was originally asked to write. I don't know why I said 'yes', other than I like to help people and I was one of the people who could say 'yes' because I was there. Frankly, I'm a bit nervous now, because it seems that having only written one story, I have garnered an unintentional reputation as a writer (my apologies to all actual writers out there) and now, I have to put up or shut up, as this next story I'll be writing is going to be under scrutiny. Anyway... I've been spending time in prayer checking to see if God really does want me to spend any portion of my time doing this. And here is the only reason I would consider it. Having nothing to do with my abilities in this area, for it is very obvious I'm weak in the area of the written word, and grammar. The reason is, because I feel it is very important that EVERY one of the team members involved in Bible translation hear about how their efforts are affecting changes. That means that people back home praying, giving funds, folks in a locked server room, everyone who is contributing to this huge team effort... that they get a chance to experience (if not first hand) the life change that happens when people receive God's Word in their lives. I get to see it first hand, face to face sometimes. Other times I get to hear about it. The reason I do videos and write these little stories, and keep this blog... is so that YOU get to take part in the blessings as well. Here's the story I wrote... for what it's worth. We have some friends in the village for the first time, starting a new translation project. They are a young married couple with a 6 month old baby. Taking care of a baby in the village is often considered the 'woman's job' by the nationals. [The Ex-pat translator] wanted me to pass along this story to you. He said that while he was meeting with the elders to decide all of these things [language learning as groundwork for launching work on a New Testament translation] a huge fight broke out in the middle of the village behind them. The leaders weren’t in this fight but had to go and break it up. I asked if there were weapons and he said some of the guys had knives so it could have gotten dangerous if it hadn’t been broken up. Once they got back to the meeting he said to the leaders that they can expect more things like this because Satan doesn’t want them to do the work that they are doing and he is going to try to make it difficult for them. They all agreed that it was a spiritual attack on the new program. He was then able to pray with the leaders. Your support is going towards this new language project. This year we'll be dedicating around 10 New Testaments! That's the fruition of something like 200 man years of labor if you only count 1 man. If you counted all of the men and women involved in supporting the work it's thousands upon thousands of man hours. At the same time, this young couple is embarking on a new project... and that means they are facing glorious time and dark times. Please pray for their work, as this is their very first stay together in their new home with their new baby. Typically the work of learning the language takes at least 2 years. You move there, make friends, get accepted, make a place to stay, have someone committed to talking to you in their language each day... and this takes 2 years to learn the language and get all this done. This family has committed during this 2 month stay, to only speaking the language. No English, no common tok pisin. As a result they feel isolated and sometimes clumsy as they need to learn how to speak again until. These radio scheds are like medicine to them. That's just another example of how we support people. Sometimes it means being a voice with hands, on the other side of the radio... making stuff work, fixing things, sending supplies, helping with medical or just listening. tonight after work, my wife said 'the posting just came out, anyone who can donate extra firewood is needed'. Recently part of our centre has become a sort of refuge camp for homeless friends... and they needed firewood to cook by. Thinking it a great chance to teach my kids a REAL application of Christ's love, I hitched up the trailer to my ATV quad, and my son and I loaded a load of firewood onto it, and drove it over. We saw maybe two to three hundred people huddled together comforting each other. We unloaded and took a few seconds to pray over the group. A well known leader and friend came and thanked us. To me, it was a very little gesture of love, but one of the wonderful things about living here is that you have many very REAL physical, practical applications of love that you can involve your children in. I hope my son can't remember today's act. The reason is I hope we do them so often and have so many of them, that this one simply melts in with all the others. Like I said, a very small gesture... but a very practical one. This is how Christ loves His people. One question I'm often asked is 'what is your chief expense there?' Answer: Groceries. Our grocery store imports from the U.S. certain goodies, for other goods we buy in country. Occsasionally Kendal gives the kids the chance to pick a dinner. My daughter picked my wife's famous 'cranberry chicken'. But this requires cranberries. So first you visit the store. They are out. Not surprising, it's a seasonal thing. But sometimes you're surprised by what they do have. Soon someone will call or email and say "I do." So a few minutes later I find myself at a friend's house with 10 Kina in my pocket. This was our conversation. "Hi Chad, Did Kendal tell you how much to pay?" "well we don't have a price." "She did say to name our price." "Okay well how does Kina 250 sound?" we both laugh. Apparently someone recently had tried to overcharge her and we had a laugh. "Yes, well I was thinking, I bought some peaches this week a can of them, and it cost 10Kina, so I was thinking, THESE ARE OCEAN SPRAY, so how is 12 Kina?" "Well, my wife told me she didn't know what to expect and gave me 10Kina. will that do or shall I put in a transfer for 12 Kina"
A transfer is our way of paying for stuff here so we don't handle cash. It makes life easier for our finance people if we don't handle much cash, as transporting large amounts of cash can be unsafe and troublesome. "A transfer would be nice." 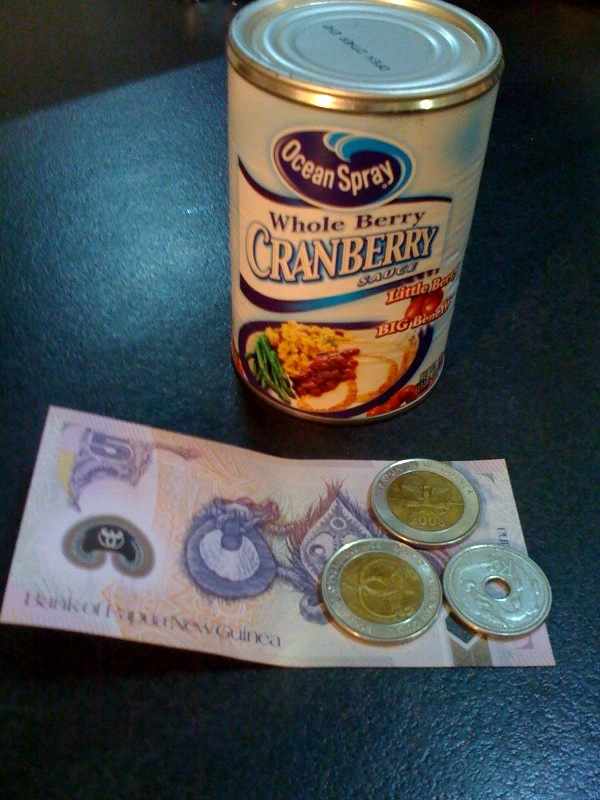 For reference, in the U.S. a can of Ocean Spray cranberries seems to average $1.90. 12 Kina is about $5.00 (at least that was the price I found when I looked online, I have no idea what current U.S. groceries cost). 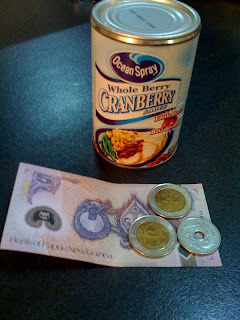 Also it left me wondering... is Ocean Spray like the Cadillac of Cranberries? Another such recent exchange for us was similar, three women were trying to come up with a solution for feeding 9 people and one of my wive's friends kept repeating 'well at home I have a WHOLE can of beans' until finally someone said 'a whole can won't feed many people'. As that friend left, they left behind with us, labelled and everything... 'a whole can of beans'. 'well, it IS Ocean Spray." In September my wife and I were surprised to find a geocache was hidden here on center, not 50 feet from where I work. So we went and we risked the bougainvilla thorns and found it. YAY! Our first cache in years. So when he left I walked over and poked my soon-to-be-bloodied hand into the leaves. Unable to find it, the manager was outside tending to his yard and said 'Chad can I help you?" Well I of course couldn't break the code of telling a muggle about geocaches... but this was his property. 'yup, sure, we got bougainvilla here'. He's Canadien, and was giving me a look of confusion and also slightly coy. I knew bougainvilla thorn pricks to swell up pretty bad because of some juice they have or something... so I pulled my hands out... and tried to deflect the conversation. 'so Chad, you ah.... looking for something?' again his coy smile... or was the sun in his eye? at this point I realize I'm the crazy American sticking his hands into the thorn bush for no reason. So I decide to play it mysterious. 'oh!' he replies...but stands there staring at me still. 'OH!' more serious of an oh this time. So I explained the hobby to him, and explained that I was looking for something that is probably gone. He seemed to understand, but with the same sort of understanding that makes anyone wonder what kind of hobby would involve poking around in thorn bushes. Never did find the cache, suppose it's been muggled.